than I have told him. long branches of perennial wisdom. would come to them through me. of light, the small chains they make. telling me things I didn't know. That is a lovely poem. It's not what I thought it would be (it took me a stanza to realize it is the mother's voice), but the poet really paints quite a visual picture. I liked it! Oh, wow. I love that poem, and as a new mom of a son, I found it really powerful. Thank you for posting it! I will definitely be looking for more of her work. 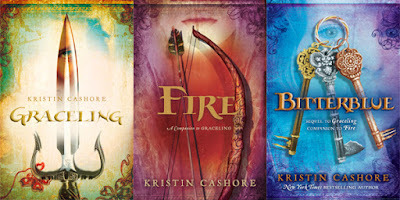 Hi Kristin, I finished Graceling last night and was blown away. What beautiful writing and what amazing characters. It helps to know that writing these days is killing you, as you put it, because that reminds me how much grit and labor must have been required to end up with such a gorgeous and moving book. I'll be watching for whatever you write, and I'm really happy you have a blog. Oh, right was right, and wrong was wrong! I rode away to right the world. And wept there was but once to die. Are woven in a crazy plaid. And he is wise who lets it go. The difference is small, my son." The which is called Philosophy. I fell in love with this poem a few years ago, and have known it by heart ever since. One day I will publish a book with this poem in the front. AH! I LOVE THAT POEM! Thanks so much for sharing it....!! he sang his didn't he danced his did. with by spirit and if by yes. Diane Swan is new to me...but not for long. I do not have a favorite poem, but I do have a favorite poet: Paul Simon. The man is genius personified. That he writes poetry in the form of lyrics makes me love him even more. Where a slight spider cleaned his narrow tooth. To find her stray child, or the moon, or both. She hurried to the ground, and slipped below. This is my first post on your blog. I loved Graceling, and am thoroughly enjoying reading your blog. Thanks for writing. I enjoyed the Diane Swan poem very much. Here is one that means a lot to me, having been read at my mother's wedding, my own wedding and featured on my sister's wedding invitation. I hope you find it as lovely as I do. Oh, thank you for all the poems so far! I love the range of stuff. And to new people, welcome to my blog! Beth, thanks for reviewing Graceling! And I don't like it--one bit. It's up to my knee. It's up to my thigh. It's up to my middle. It's up to my neck. It's upmmmmmmmmmmffffffffff . . .
and your throat is filled with the silt of it. more fit for gills than lungs. only more of it, an obesity of grief. Kristin - That last one you put on there is a Shel Silverstein poem, isnt it? I've always loved him and almost put something of his down there but thought that would be way overdoing it (which I thought I had already done anyway). Where the Sidewalk Ends? I'm partial to this one by Jack Prelutsky. It's so much fun to read aloud! Hey sis!!! I just got a great gift - Your book!!! I'll not have to wait the Portuguese version to read it... I'm sooooo happy!!!! Thanks a lot!!! It's a gorgeous book... everybody in my family loved it!!! Thanks one more time and congrets for the great job!!! Blowing like a leaf in the green shadow. JU!!!! OH MY GOODNESS! MY PARENTS ARE IN TOWN AND WE WERE JUST TALKING ABOUT YOU AT DINNER AND WONDERING IF YOU'D GOTTEN THE BOOK! Yay! Thanks for letting me know you got it!!! Greetings! This is Kristine from NJ. This might not be the best 'post' to comment on but I just finished reading "Graceling" and just had to tell you how remarkable it was. I enjoyed the story and got so into it that sometimes I laughed out loud, and at other times, especially at the end of some chapters, I had to put the book down and take a moment to absorb what happened. It was a very well rounded book. There was action, drama, romance, and also issues that addressed girls and women in general. I found Katsa's story thoroughly enjoying as well as inspiring. I'm telling my friends to read this book. Thank you again for your great storytelling. My only disappointment is that your next book won't be out until October, haha. When I(Melina) posted a few days ago, I forgot one of my favourite poems(I know, I know. If it's my fav how could I forget it, right? But it slipped my mind). Even though it's a bit late, here's Fire and Ice by Robert Frost. Aw, thanks Kristine! And Melina, I love that one, too. I am definitely going to do poem posts again in the future. I love reading everyone's poems. Beyond, my favorite line from that movie: "You completely me." I liked it because it was a parody of the same line in Jerry Maguire, and I didn't like it in Jerry Maguire, so I loved that they made fun of it in Dark Knight! Did you see JM? No I've never seen Jerry Maguire. Im not a fan of Tom Cruise so I try to stay away from watching his movies(unless there isn't anything else on). Is it a good movie? *pouts* I bet all Heath Ledger need was a good hug and an ear to listen to his issues. *sighs* It's always sad when we lose a great actor. *remembers the hospital scene with him in the nurse outfit* Haha.. that part was the best! I HATE TOM CRUISE, TOO. And no, it was not a good movie. What a beautiful poem, Kristin! And I'm loving the other poems people are posting, too -- especially the ones by Richard Wright. What a feast this blog is! As for me, I'm having a very hard time picking a poem. But I think I'll post one I just heard quoted this Easter. Because I have fond memories of it -- I come from a family where recitations are common, and people also burst into song at the drop of a hat. It's actually a very nice way to live (as long as people can carry a tune)! Crying _What I do is me: for that I came_. It's a very Catholic poem, but I hope you don't have to be Catholic to like it -- Hopkins was someone who saw god in the beauty of the natural world, and I hope that's universal. To see him through a microscope. What nobody is sure about! In Which I Use One of My Favorite Words. Thrice.